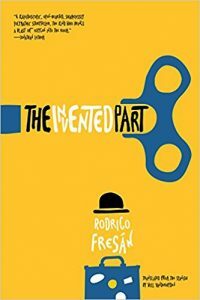 A brilliant, sprawling exploration of what it means to be a writer and how the literary mind both apprehends and attempts to reshape reality, The Invented Part is one of those books that isn’t really a book but an experience. Composed of several large sections (which Fresán has said he worked on simultaneously), this novel ranges widely across the landscapes of the imagination, meditating on (to name a few) F. Scott Fitzgerald and the writing of Tender is the Night, the soundscapes of Pink Floyd and Bob Dylan, and 2001: A Space Odyssey. All of this is important to the story of The Writer, who, in his despair over the state of literary culture and the related disturbing rise of texting, twitter, and e-books, decides to throw himself onto the Large Hadron Collider in Switzerland and merge with the “God particle” so he can become a kind of meta-writer, with total control over the plotline of reality. After all, what does a writer do but manipulate characters and stories in order to create a discrete reality? How is this not like the way in which many of us think about God/omnipotent entity and his/her/it’s relation to what we perceive as everyday existence? But The Invented Part is about so much more than one writer’s disillusionment and extreme measures. Fresán draws us into each discrete-yet-connected section until we forget about the world outside of the book. His narrative voices toy with the stream-of-consciousness approach, so much so that you’ll find yourself forgetting for long periods of time that you’re even reading someone else’s thoughts. Fear, longing, dread, desire, inspiration: all of these reach up and drag you down into the sea of cascading ideas, just as The Boy (who becomes The Writer) at the beginning of the book nearly drowns in the ocean, only to emerge reborn and inspired. One of the most enjoyable aspects of the book is Fresán’s unflinching efforts to probe the implications of writing as an infinitely meta endeavor. One of my favorite sections occurs in the middle, where Fresán offers us what appears to be a series of notes about F. Scott Fitzgerald and his friendship with a wealthy American ex-pat couple as he’s writing Tender is the Night. In the margins, at one point, I wrote “A writer (Fresán) writing a book about a writer (The Writer) writing a book about a writer (F. Scott Fitzgerald) writing a book (Tender is the Night).” Let that one sink in. This is the kind of novel that defies summary, so I’ll just leave you with some of my favorite moments from the text. I have so many, that it will be hard to choose (after all, I’ve dog-eared almost every single page). “A book that thinks like a writer in the act of thinking up a book, what he’s thinking about when he happens to think of a book, when that book happens to him, and about what happens with that book. A book that would be read in the same way it was written. A book that would be read- like those medieval monks read, perfecting first the art of reading in a low voice, their lips barely moving- like a prayer…. A book like antimatter, like the antimaterial that- its energy so dark- will turn into another book, in another dimension….” (530).